Recently I posted a list of my top 10 favorite movie monsters, but King Kong wasn’t featured amongst them, not because I don’t like him, I just preferred the other ten monsters I selected. 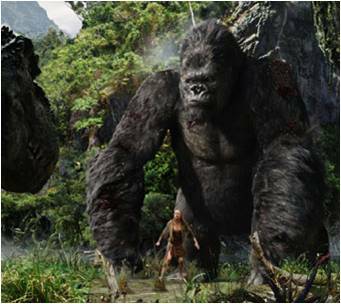 But now I feel like giving proper mention where it’s do, after all, King Kong is one of the biggest movie monsters of all time. 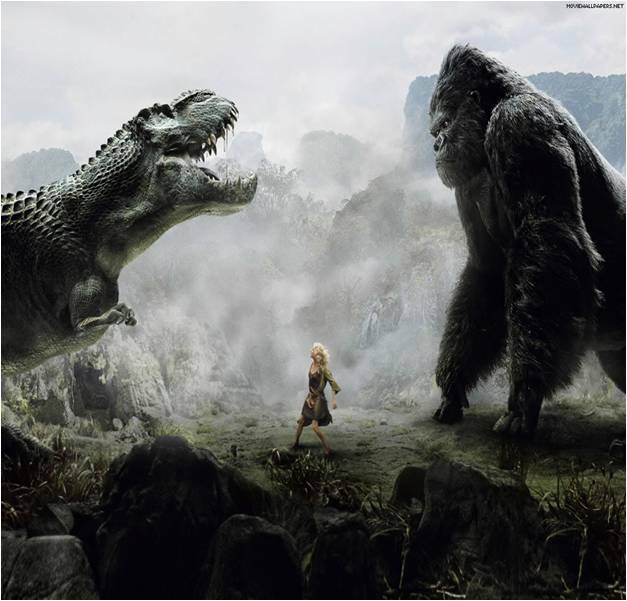 So here’s a complete look at King Kong’s film legacy and my individual thoughts on each film. The 1933 classic “King Kong” is a rare monster movie that’s often regarded as one of the greatest classic movies of all time and honestly for a good reason. Considering that this is a film that came out when film was just being developed, it’s unbelievable what these film makers were able to accomplish with such amazing visual effects. Sure, now days it doesn’t look that stellar but for back then, it’s probably one of the biggest visual breakthroughs in film history. The Jungle setting is such a rich spectacle to look at, the stop motion monster effects are great (not forgetting all the awesome dinosaurs in the film) and the climax of Kong on the top of the Empire State Building is still just as cinematic as ever. On top of that, this is a classy story that explores the soul of a monster, making the audience cry and scream and the same time. It’s just a terrific combination of B monster movie clichés and a timeless beauty and beast story, just a perfectly constructed adventure flick on all grounds. 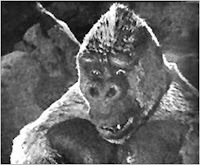 In that same year, 1933 there was a sequel titled “Son of Kong”. This was the only sequel to the first film and it will be a tradition that whenever they remake a new King Kong film, they’ll only have one sequel. This is an okay, good sequel, it brings back Carl Denham from the first film (and even played by the same actor) and it further develops his character. 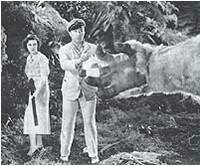 He’s feeling terrible for all he’s responsible for and after being abandoned on Skull Island again he discovers that Kong had a son. There are some fun moments, enjoyable stop motion effects and while it’s nothing great, it’s not terrible either. It’s just overshadowed by far better classic monster movies. 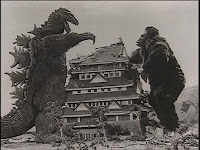 A foreign monster movie company called Toho (the same company that distributed Godzilla) required the rights to King Kong and planed on creating their own series of King Kong films, with him battling a new monster each time. Then it was decided that this series would begin by having King Kong battle their most famous monster, so in 1963 we got “King Kong vs. Godzilla”. This was the child hood fantasy of my dreams, the two most famous monsters of all time clashing in one film, and if a cheesy B monster flick is something you enjoy then that’s what you get. 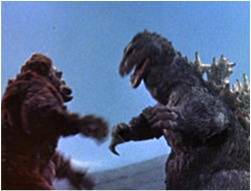 While continuing the Godzilla series, this film also works as a Japanese remake of the original American King Kong classic. We still have sailors going to an uncharted island (which features a giant octopus battle as opposed to Dinosaurs) where they discover King Kong, bring back to civilization where he get’s lose, grabs a young woman and climbs the tallest building, just done in a foreign setting with Godzilla thrown in the mix. This is the first time King Kong would be featured in a rubber suit as opposed to stop motion animation. It’s simply two rubber suited monsters going into battle, making for fun trashy entertainment. In 1968, Toho released another film titled “King Kong Escapes”. 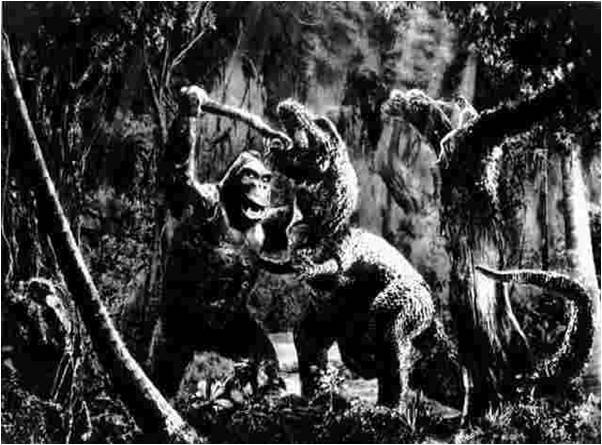 In this film, King Kong battles two new monsters, a giant mechanical gorilla called Robot Kong and a dinosaur creature called Gorosaurus (and a brief fight with a sea serpent). This film also falls in the trashy entertainment category, just a bit stupider and lacking the same campy enjoyment of “King Kong vs. Godzilla”. 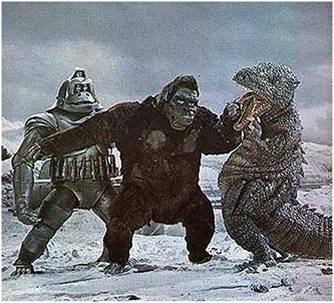 For some reason, Toho didn’t release any more King Kong movies after this and focused more on their Godzilla series. So every King Kong movie after this is owned by American studios and to date he’s had no more foreign films. In 1976 there was an American remake, this time just titled “King Kong”. This one attempts to be more like the classic and modernizing it. There’s a good cast here (including Jeff Bridges as our lead hero) but the production quality is far less impressive then the original 1933 film. There aren’t any dinosaurs in this one, just a cheap looking giant snake that Kong briefly fights, the jungle is far less exciting to look at and the climax takes place on the World Trade Center as opposed to the Empire State Building. King Kong is again a guy in a gorilla costume but now he has this stupid smile which will make you either laugh or cringe in fear. Overall, I suppose this remake is passable for cheap B movie amusement but still not one that I recommend. 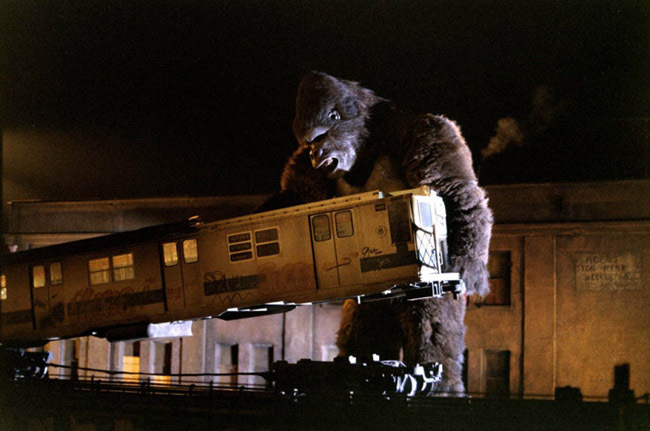 A direct sequel followed in 1986 titled “King Kong Lives”. Apparently after the events of the last film, Kong survived, how he could survive being shot down by a helicopter and falling off the World Trade Center is beyond me but things only get stupider. After trying to kill Kong in the last film, a big group of people are spending lots of time and money trying to keep him alive, then some random guy in a random jungle just happens to find another giant Gorilla, except this one’s a female. The media isn’t that impressed either, they just treat the discover of another massive gorilla as yesterdays news. 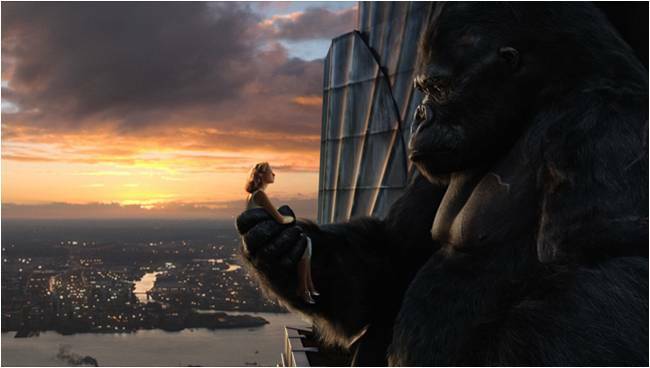 Kong finds himself falling in love with it and in the end, they have a son. We get lots of unbelievably stupid moments like this one scene when Kong sweeps the female Kong off her feet cares her through a battle field, much like how a knight in shining armor would carry a princess off into the sunset. We also have a scene where Kong is captured by a bunch of stock red necks that feed him bottles of bear and there’s just constant stupid, random scenes like that. 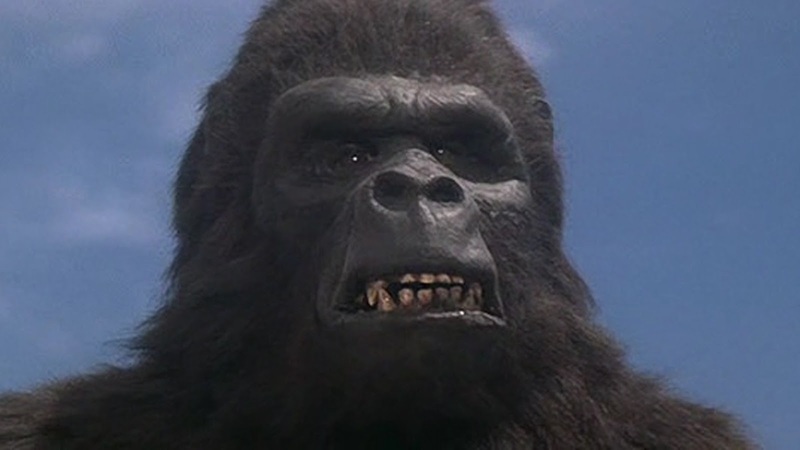 The gorilla costumes look a lot sillier, the effects are terrible, the acting is over the top, it's just a mess. Linda Hamilton (who played Sarah Connor in "The Terminator" movies) does an okay job as the leading heroine but she doesn’t save this from being the worst of all the King Kong movies by far. It can’t even pass as trashy entertainment, it’s just trash, plain and simple. At last in 2005, there was yet another remake just titled “King Kong”. This film was written and directed by Peter Jackson, (who also did the “Lord of the Rings” movies). This was his dream project, to remake one of his all time favorite movies with respect and love for the source material. I congratulate Peter Jackson for putting so much effort into something that he really wanted to do and that it turned out to be such a smashing hit. But in all honesty, I didn’t like this film at all, I felt like it was trying way too hard to be more than a B monster movie which only made it feel stupider. The characters are extremely boring and the film spends way too much time with them, I mean for goodness sakes, it takes about 70 minutes just for them to get to the island. The film also losses itself with too many overly long battles with giant bugs and stampedes of Dinosaurs. Worst of all, the relation between the girl and the gorilla, is way over done. The original was very simple, creature gets curious about woman and the girl in return feels sorry for an innocent creature getting killed, but this remake actually has them going ice skating together, that’s actually on par with the stupidity of “King Kong Lives”. It’s just 3 and a half hours of my life that I want back and this is coming from someone who actually enjoys those silly foreign Godzilla movies.